Although the rail and automotive industries were always competitors, they shared technology and talent occasionally. Manufacturer Edward Gowen Budd left his mark on both industries during the first half of the century. Born in Philadelphia in 1870, Ed Budd book-ended his career with trains. Starting out as a machinist apprentice in 1887 in Philadelphia, he later helped build the Pennsylvania Railroad's first steel passenger car. By 1933, he was using steel again, this time to create an innovative train that would revive the passenger rail industry and lead to distinctive industrial design in everything from automobiles to irons. In between, though, Budd threw his hat into the automobile-industry ring. In 1912 he started the Budd Company, which initially specialized in the manufacture of pressed-steel frames for cars. Steel was taking over, but some manufacturers still built wooden cars. Convinced of steel's superiority, Budd -- always with an eye toward publicity -- dramatically situated an elephant atop one of his steel cars, a feat he dared wooden car makers to try. The Depression hit Budd's auto-body business hard, but it gave him "time to think," he said, about potential new steel markets. Soon Budd was looking into developing his idea for using a lightweight alloy -- a type of stainless steel called 18 and 8 (low-carbon steel with 18 percent chrome and 8 percent nickel) -- to build trains. Stainless steel was both attractive and practical: strong; light; malleable; and, perhaps best of all for trains, it did not rust, no matter what exposure it had to the elements. Its assets were obvious, but as of yet, stainless steel was somewhat underused. Paving the way for others to use it, Budd came up with and patented the "shotwelding" process, a method that allowed stainless steel to be fabricated. Nothing of this sort had been done before. Shotwelding preserved the strength and rust-resistance of stainless steel; this was a breakthrough, because ordinary electric welding would destroy these qualities. Though British and German researchers had developed stainless steel, with shotwelding Budd inaugurated what one writer called "the modern age of metal fabrication, and snatched the lead in developing what would become one of the most prized 'miracle metals.'" 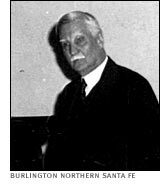 In 1931 Ralph Budd, the recently appointed president of the Burlington Railway (and no relation to Edward), suspected that stainless steel was just the sort of injection that passenger rail travel needed to give it a boost in the lean years of the Depression. After taking a demonstration ride through Philadelphia on an E. G. Budd-produced stainless-steel gas-electric car, Ralph Budd was convinced, and commissioned the Budd Company to build the Zephyr. Ed Budd's steel car was a radical departure for the rail industry. There was nothing traditional about the new Zephyr. Its shape was not only streamlined for aesthetic reasons, but also for speed; the shape reduced air resistance. Even the inside of Ed Budd's train was novel, with air conditioning, soft lighting, and pale, cushioned seats replacing the traditional red-plush chairs that had been so uncomfortable on hot days. Budd added a new diesel engine from General Motors, and the Zephyr was off and running, faster than any train had traveled before. Ed Budd's train rejuvenated the passenger rail industry in the 1930s, but for the duration of World War II, the Budd Company dedicated itself not to railcar manufacture but to the war effort. For its famous bazooka projectile, the Budd Company earned the Army-Navy "E" award for outstanding war production. Ed Budd received the American Society of Mechanical Engineers' highest award in 1944, for "outstanding engineering achievements." In 1985, 40 years after his death, Edward G. Budd, the "father of the stainless-steel streamliner," was inducted into Dearborn, Michigan's Automotive Hall of Fame.